Her cultural background is a mix: born in Wisconsin to Pakistani and Persian parents, she has lived everywhere from New York to Sevilla. Her design experience includes roles at Catherine Malandrino and Zac Posen. Currently, you can find her thoughts as fashion contributor for New York Post's “Alexa”, a luxe travel contributor for the New York Post and fashion and accessories editor for OliviaPalermo.com. What I like about her: she wears the look not the brand! 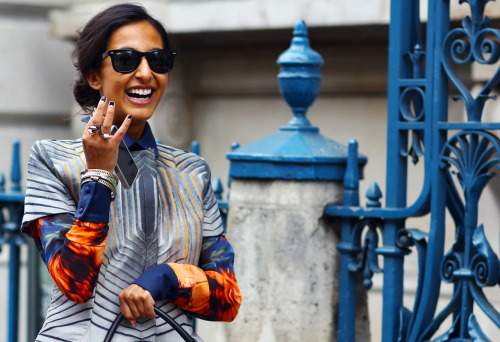 It is rare to find a street style that isn't a slave to specific design houses or trends. Yet, when you see images of Nausheen, the trends are a background interpretation of her true self (at least in my opinion!). Definitely one to watch!Be sure to bookmark her blog and follow Nausheen on Instagram! Middle Eastern Princess necklace via Le 21eme. Falling for Fuchsia via TheUrbanSpotter. Umbrella girl in Milan via Le 21eme. Orange jacket in New York via Nordstrom. Creme de la Creme center via A Shah's Life.